PROPERTY DESCRIPTION: Beautiful custom built 4 bedroom 3 1/2 bath ranch style home with 80+- acres south of Leon in Butler County Kansas. This brick & native stone house has a grand entry way and great front porch to set the tone as you enter. Main level features include a living room w/ fireplace, formal dining room, and a huge kitchen with an island. Great main level entertaining space! The main level has 3 bedrooms, 2 full bathrooms, and a half bath. Additional rooms in the walk-out basement include 2 living family room areas with a New Aire insert fireplace, wet bar, 1 bedroom, bathroom, and abundant storage! Custom trim, Bosch dishwasher, built-in GE oven/microwave combo, & Pella windows are just a few of the interior amenities. The attached 3 car garage is huge! Need more storage space? A 50′ x 30′ metal building w/ concrete floor and HVAC should cover that! 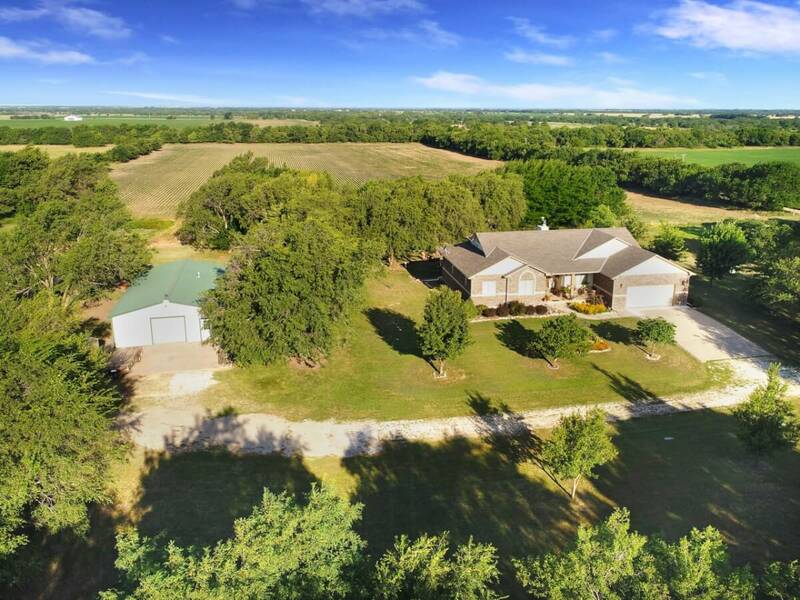 All of this and 80+- acres for hunting, horses, cattle, or whatever other livestock you prefer! The pond has nice clear water, and the property is abundant with Kansas Whitetail Deer, Turkeys, and Quail. Approximately 65 acres are currently utilized as native hay meadow, and another 11 acres are currently planted to soybeans. LEGAL DESCRIPTION: The W/2 of the NE/4, Section 3, Township 29 South, Range 06 East of the 6th PM, Butler County, Kansas. 2016 REAL ESTATE TAXES: $3480.22. PROPERTY LOCATION: From Leon, Kansas at HWY 400, South on Chelsea/Cole Creek Rd 8 miles to 180th, East 1/2 Mile to the property.